It is vital that you stay in your homes… Unless you’re venturing out to Cascade Drive-In, Illinois’ largest outdoor cinema, where Filmspotting hosts Adam Kempenaar and Josh Larsen will be on hand to usher in a Zombie Apocalypse Double Feature! Don’t miss your chance to treat that delicious brain of yours to 2009’s smash hit Zombieland and Edgar Wright’s 2004 genre send-up Shaun of the Dead on the big screen. Zombieland is a 2009 American zombie comedy film directed by Ruben Fleischer from a screenplay written by Rhett Reese and Paul Wernick. 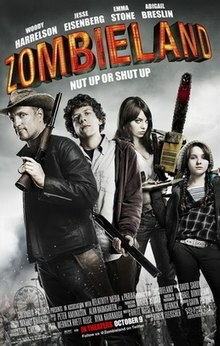 The film stars Woody Harrelson, Jesse Eisenberg, Emma Stone, and Abigail Breslin as survivors of a zombie apocalypse. Together they take an extended road trip across Southwestern United States in an attempt to find a sanctuary free from zombies. Shaun of the Dead is a 2004 British horror zombie comedy directed and co-written by Edgar Wright, and co-written and starring Simon Pegg alongside Nick Frost. Pegg plays Shaun, a man attempting to get some kind of focus in his life as he deals with his girlfriend, his mother and stepfather. At the same time, he has to cope with an apocalyptic uprising of zombies.